Expelled Dravida Munnetra Kazhagam (DMK) leader MK Alagiri, who led a rally to his late father M. Karunanidhi's memorial at Marina Beach in Chennai on Wednesday, asked if the party would oust all those who supported him. 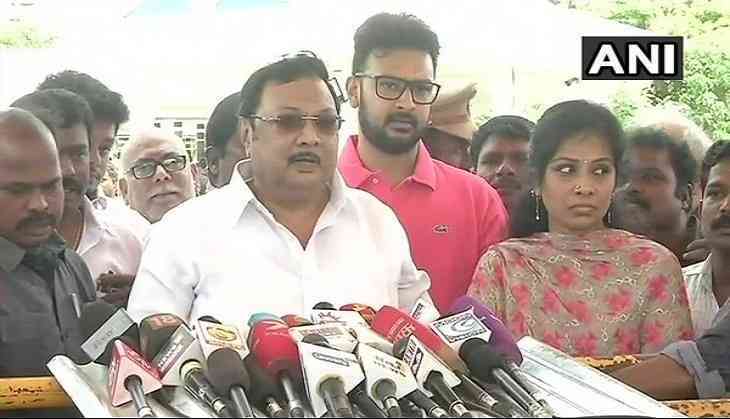 Alagiri's statement came after his close aide, PM Mannan, told ANI that DMK cadres who received Alagiri at the airport earlier in the day were suspended from the party. "One lakh people came here to support me today. Will they (DMK) send all of them out? You ask them and let me know," Alagiri told media here. On August 25, Alagiri, the elder son of Karunanidhi, had said that his rally would be a threat to the DMK. "Yes definitely, it (rally) will be a threat. I have never aspired for any post in the party ever, even when Karunanidhi was alive. Stalin is in a haste to claim the presidency," said Alagiri, who was ousted from the party in 2014. The political battle between the brothers - Alagiri and MK Stalin - intensified after Alagiri on August 13 claimed that his father's "true relatives" were on his side. However, Stalin, in a clear majority, was elected as the party president by the DMK general council on August 28.